I love using this product in the summer time. It really helps to clean my skin and clear all my dirt from my face. I have to use another type of product when it is the winter time because this product cleans too much of my face or it is just too harsh during the winter or fall months that I have to switch over. I have combination skin in my T zone and normal on my cheeks. When I use this product during the colder months, my face breaks out on my cheeks then spreads to the other parts of my face. I am still recovering from using this product too long in the fall months or colder time of the year. I do love using this product when it is warmer out to keep my face clear and clean. I wish that I could use this product year round but my sensitive skin just will not allow it. Be aware if you have sensitive skin, use it in the summer or warm months but you will need to change it when it comes to winter or colder months. 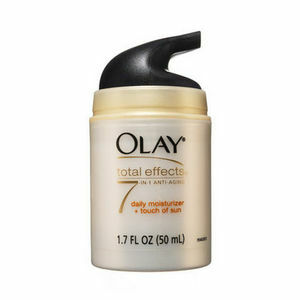 This anti-aging daily moisturizer by Olay Total Effects is a great product. 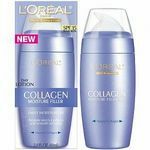 When I used it I noticed it is thicker than most moisturizers which is good for the winter months. It absorbed quickly and evenly into my skin. It also has the added bonus of being SPF 15. When I used this product it was tinted so it doubled for me as a concealer. When I used this it never caused my skin to become oily or have clogged pores. It left my skin feeling soft and smooth even after I washed it off at night. The price is reasonable and it is worth every penny. I would suggest starting to use this product sooner than later! I can definitely tell the difference since I started using it. Absorption It absorbs very well, but it is not thin enough that you no longer feel its presence an hour later. This means you do not have to reapply every few hours just to feel it working. Doesn't Clog Pores It has never caused me to break out. First of all, this moisturizer did work for me at all, I have oily skin, and it really isn't for anyone with any type of oily skin. whether you have a lot of oil or just a small amount. It was a waste of money and very expensive, this is the first product from Olay that didn't work for me. It's more of a dry skin product. Absorption The absorption was terrible, it left my face feeling greasy. but...... like I said I have oily skin. Doesn't Clog Pores I felt like it left my pores clogged. Effectiveness It had no effect on my skin, maybe it would work better on dry skin. Olay Regenerist is a brand that I trust and use regularly for a number of different products. This Detoxifying Pore Scrub is no different. I love to use it in place of my regular facial scrub a couple of timer per week. This is better than your average scrub in the sense that it gives me about a 50% deeper exfoliation than regular products. It helps me clear out those unwanted clogged pores and blackheads that other products cannot reach. It is not too harsh on my skin, but it does such a great job of cleaning it. 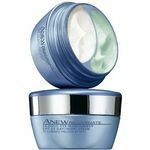 It also works so nicely to use at night right before I use my favorite night cream or moisturizer because it sloughs off all the dead skin cells just in time to rejuvenate during the night. Not only does it exfoliate, but it also gets a great lather with enough water to actually clean my skin as well. It has a great scent that I love. The beads in this formula are not too rough for my skin either. I do not have to spend twenty minutes washing my face to get great results. I would definitely recommend trying this product and pairing it with other Olay Regenerist products to get the best results. Using this 2 or 3x per weeks has really done wonders for my skin. I like that it detoxifies the skin and leaves it silky smooth and clear. It is not a harsh product and does not irritate the skin because of the perfumes and the alcohol content. It is designed to improve the quality and the texture of the skin and it has done that for me. I love that I can visibly see the difference in the texture and the tone of my skin, in a relatively short period of time. Absorption Great absorption rate. It lathers up very well and does not dry the skin out, like some pore cleansers tend to do. It is very light and airy so it goes on pretty smoothly. Doesn't Clog Pores Does not clog the pores. Effectiveness This is magic in a bottle for me and for my pores. It seems the older I get the bigger they get and the more time I spend trying to find something that will decrease the size of them. It also helps to minimize the number of breakouts I experience. This product has worked wonders for me in bothersome areas. I am a lifetime user of this product. Good product for dry skin. This product worked great for me; it moisturized my skin without leaving it greasy and it tightened my skin a good amount. People complimented me on it only a few days after I started using it, claiming that I looked 20 years younger. It was a great moisturizer, too, and I love using it just for that. It wis on the more expensive side, which was unfortunate, but it was worth it for me. I do have to warn people though: from the reviews from my family and friends, this product is only for those with dry skin. My friends who tended to have oily skin said this product leaves them feeling greasy and unclean, and it doesn't absorb well into their skin. I didn't have this problem, but from what I hear, it is a common problem. Absorption It worked great for me, but let me emphasize again: this product is only for people with dry skin. It will moisturize it the right amount without leaving it greasy. I absolutely adore using Olay regenerist detoxifying pore scrub. I had tried similar products in the past but this one really is amazing. I absolutely loved that I could tell a dramatic difference in my skin after just one week of using this particular product. Something else I loved about this product was the price. It really is affordable. Also it is very easy to purchase. I bought mine from the drugstore. I love the texture of this product. Sometimes scrubs for your face can be harsh and abrasive but not this particular product. It's effective without being too harsh on the skin. My pores were visibly smaller after just one week. I definitely think it's worth every penny. Also you can sometimes find coupons for this product making it even more affordable. I do plan to continue using this product and I would recommend it. Doesn't Clog Pores Left my pores looking better than ever. Effectiveness This is a highly effective product. Good Product but no "Fountain of Youth" in a bottle. I have used Olay products for a long time and consider Olay a brand that I like and trust. Olay's Anti-Aging Daily Moisturizer is a feel good moisturizer that I would give high marks, however I haven't found it to be a "Fountain of Youth" Absorption This is a easy to apply, feel good moisturizer that does not leave a greasy slick feel on my skin. It has a light clean scent that is refreshing and not over powering. Doesn't Clog Pores Living in a desert area my skin always feels dry and that calls for a moisturizer on a daily basis. This product is better than most for not clogging pores and leaving the skin feeling baby soft. I really like being able to use it at night and not having a residue or greasy spots on my pillow or sheets. Effectiveness While this product has not made me look any younger and I am still waiting for the anti aging part to kick in, I would say high marks for it as a moisturizer. I am not sure how it would be on oily skin but for my dry skin it's great. Its an alright product but nothing special. Helps to moisturize skin and leave it looking and feeling fresh, but does not do anything for signs of aging. Atleast that was my experience Absorption Product is really creamy and not greasy feeling at all. It seems to absorb into the skin really well and fast. Makes your skin feel soft and refreshed. Doesn't Clog Pores I do not have a pore problem, so not a good one to answer this, but I experienced no problems with this. Effectiveness Like I mentioned earlier it is great for hydration, softness and fresh feeling. I did not notice any improvement in wrinkles, lines, dark circle or spots.